P: Hi everyone! Today we’re here with Talia Stroud the Director at UT Austin’s Center for Media Engagement. I was wondering if you could tell me about the Center for Media Engagement’s mission and what you’re focused on as a director there? T: Sure, so the Center for Media engagement is dedicated to trying to help newsrooms meet their business and democratic goals. We do this by doing research projects, so we work with news organizations to figure out what kind of questions they have and whether research can be brought to bear to help them figure out what the answers are. And then we design a project in collaboration and then execute it and share the results broadly so that the journalism industry at large can benefit from it. P: Your team has done some amazing research, and I’d love to give everyone a taste of what you’ve taken away from that research. I’m going to share the names of your studies, and it would be great if you can share one interesting takeaway from each. So - sort of a quiz style. T: This study was incredibly interesting! We collaborated with the News Collab out of Arizona State University. What we did was interviewed people in different communities, interviewed the journalist, and interviewed news sources. We asked them a whole bunch of different questions on how they perceived the media. A striking result from this was that the journalists were a lot more positive and optimistic about their contribution than the public was. So there were these huge disconnects about what the newsroom thought it was doing for the community and what the community thought it was doing for the community. So that was the big takeaway from that one - how important it would be to bring those views back together. T: I love all of the studies, but this one has a soft spot in my heart. So this one was all about what newsrooms were trying to do to bring people across lines of difference together. And so, we did interviews and surfaced 25 different examples of newsrooms doing this work and we looked through the academic literature to find out what are scholars learning about helping people appreciating a point of view other than their own. And then we offer some details in the report for what academics can learn from what newsrooms are doing and what newsrooms can learn from what academics found in their research. So, it’s a fun one reviewing what newsrooms and academics can learn from each other. T: This one was a super interesting study - we partnered with 3 different newsrooms and over the course of 2 weeks launched 23 different experiments on Facebook. Which is small beans for you at Naytev, but for us it was a big deal. What we were looking at was how we could get subscription messages to yield the best return. We did this both via email and via Facebook post and one newsroom even did one of these in the newsletter. What we found for Facebook posts was that it’s not a good idea to use your logo as an image, it’s a much better idea to use journalists doing their work or an image representing a top story that the newsroom has covered. For email, what we learned is that using a message that you’re including in the subject line about what people can gain from a subscription is a stronger appeal than something that tells people what they might lose if they don’t seek this opportunity. So that was another component of this - where we looked at both images and messages. T: On this one we partnered with a news organization that has a number of different TV stations across the US, the Grand Media Group, and with them we designed this study where 7 different stations across a certain period of time were varying several different attributes of their links. So first they varied: whether the links were in the middle or the bottom of the article. We found that links at the bottom of the article received more clicks. Second they varied whether the links contained an image with them or did not. We found that there was higher click through when the links contained an image. Third, we looked at whether the links were to related content, similar content, or popular content. What we found was that related content performed better - with one exception! When people were coming to the site from social media the popular content did slightly better. The fourth was varying the word used to identify popular or related content. And we found that the very simple words: “related content” or “popular content” did better than when we tried to jazz it up and get creative - so simpler was better in terms in language. T: This was a study done by two of the students in our doctoral program, Emily Van Duyn and Jessica Collier, and they had this really interesting idea which was, “How will people perform if we ask them to determine if content is fact or fiction?” and then if before they do that prime some of them to think about fake news and don’t prime others to think about fake news. So what they found is that if you prime people to think about fake news (even just hearing the word fake news) and then you give them some articles and ask “Is this real news or fake news?” it turns out people actually get worse at identifying what real news is when people have been primed to think about fake news. So all this discussion about Fake News that we’re having publicly right now could be really problematic because it’s emphasizing to people “oh this may be fake” and make them more skeptical of news that’s actually real. P: Oh my gosh. That’s pretty scary! T: It is a scary finding. P: This is going to be tough going through these Talia! Each one I need to think a little more about and let sink in. T: You can always find more on our website! T: Oh, this is a really fun one that we go to work on with you guys! This one was just a super exciting project - we collaborated with a national news association and to randomly show people Facebook posts and see how they responded. And we did two different versions of this, the first one was seeing whether the text and the image associated with a political post was more positive or more negative and the second one we looked at whether the post was talking about strategy coverage, by that I mean who is ahead, who is behind, what are the most recent poll results, and the alternative to strategy coverage is issue coverage where you talk about the substance and topics relevant to a campaign. We did all these tests and we found first - the coverage that was more negative was generating more clicks and we found that coverage that was more strategy oriented than issue oriented was generating more clicks. When we looked at engagement though, we found the opposite pattern. It was a really interesting study that shed light on how engagement and clicks can be different. P: That was a really fun study to do with your team, and we’ll make sure to share the SXSW Presentation where you led a panel exploring this topic more with everyone involved in the study. T: Yes, you were up there too! It was definitely a fun time. T: So my colleague Gina Chen who is Assistant Director at the center and several of her colleagues embarked on a study where they were interviewing female journalists around the world and asking about their experiences online. There were two striking findings in the report. The first is nearly all [female journalists] had experienced some form of online harassment, so it seems to be a really pervasive problem no matter where you live facing women journalists. The second is that most newsrooms were not doing a lot to help them deal with this problem. I think that there’s so much that should and can be done to help people navigate these moments where they’re harassed online. P: Wow, that’s one that I actually need to go back and read in more detail. T: Yeah, and the quotations that Gina and her colleagues share...it’s just unbelievable what these women have been through. T: So on this one again my colleague Gina led this one and what they were looking at is what happens when you show people a quiz about entertainment options, so like a standard quiz that you might find online would be what’s the latest thing that happened with Kim Kardashian, versus a quiz asking about political content. 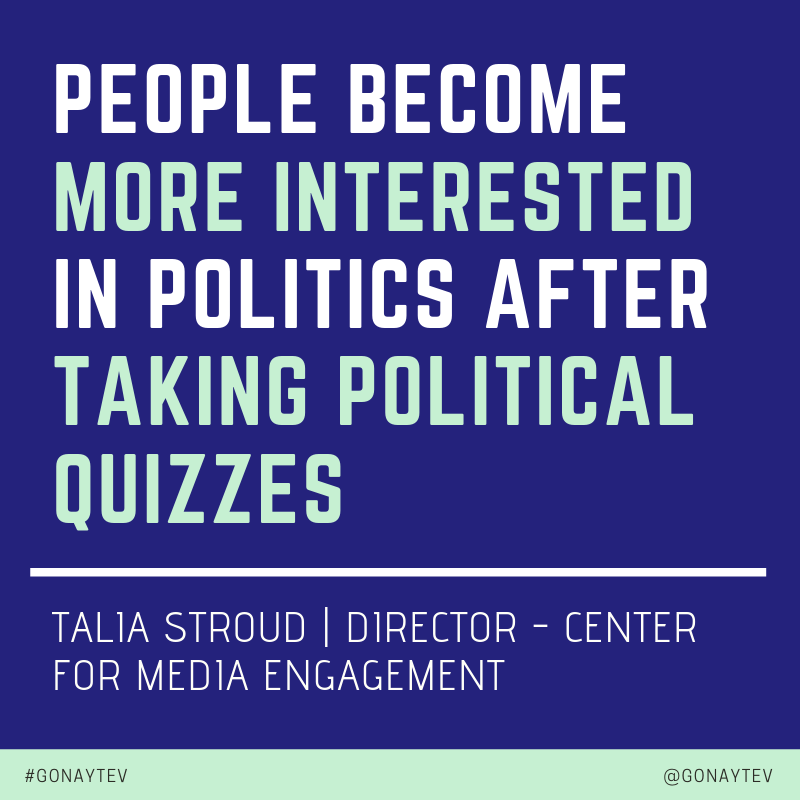 These quizzes are something that we developed at the Center for Media Engagement and on our site we have a tool on our site that’s available for free that anyone can use that allows you to program a quiz. So we used that exact tool for this study. So in the study what Gina found was that if people were taking political quizzes afterward they were actually more interested in politics. These quizzes not only can help people learn, but they can also help to inspire people’s interests. Which we found to be a really exciting results. P: I will make sure we share the Center for Media Engagement's quiz tool. T: Yeah! And the quiz tool, it’s been very exciting to see, it’s been used now on over 150 different news sites and people are really super creative on asking their audiences questions and they’ve gotten good responses from their audiences, so we definitely welcome anyone interested to come check it out and use it. T: We’ve been working on this research with The Center For Investigative Reporting now - and we are working on a report that will be released early this year. The Center for Investigative Reporting has been doing a fascinating approach to journalism, with Story Works and Reveal, they’ve been creating journalism through plays. Then actually having live theater performances where people can come and learn about different topics. So they did one about civil rights activists, they’ve done another one about a shipyard and they’re fascinating plays that are based on actual events and they’ve actually done all of the hard work of reporting them as journalists. So what is conveyed has strong reporting behind it. So, we’ve now done a series of studies with them where we ask a random half of people before the play to tell us what they think about all sorts of things and the other random half of the audience we ask them after the play. And we find out are there any differences between those people and what they came to the play with and what those people left the play with. We’ve found that across these three different plays they’ve put on, they do have an affect on what people think about the world, on what they know, on their interest getting involved in their communities. So it’s a really powerful model and we’ll be really eager to share the final results in the next few months. P: I can’t wait to see those results. It also has some really interesting implications for the movie industry for example. Whether theater or movies or any creative art - it shows that it can have enormous impact on the perceptions of the world we live in. T: It totally does and I think the thing that makes this one powerful is that they have done the reporting so it is an accurate portrayal. They’re also including this thing called the “Talk Back” at the end where the actors and sometimes the actual subjects of the plays are in the audience of the plays to share their experiences. I just really admire what they’ve been doing and I’m thrilled that we were able to do some research with them. T: On this project we worked with McCormick Foundation and City Bureau, which is a news startup out of Chicago where they’ve been all sorts of interesting and really innovative techniques trying to bring journalism to the public. For this particular study, we wanted to try and understand how does geography relate to the news media. We looked back and we did a massive survey in Chicago and we looked at people in the North Side, South Side and West Side of Chicago and we found really striking differences across these areas. Those in the North, in general, were relatively satisfied with their media coverage. While those in the South and West Sides thought that the media coverage was overly negative and was not portraying them accurately. And the really interesting part was that we asked people how interested they would be to get involved in the media and what they were doing in their communities and people on the South and West Sides were actually more interested in getting involved than those on the North Side. I think this report shows how geography matters so much and shows that there’s enthusiasm for citizens being involved when they can! P: It sounds like there are some very striking discrepancies in a small geographic area. I can’t imagine what it’s like blown out in a much broader geographic area. T: I agree! I was actually surprised by how intense the differences were. Oftentimes you do these surveys and it’s like “Men are 6% points different from women.” and people sometimes make a big deal out of that. Here we’re talking about things like “20% differences!” So these were not small differences in what people thought about the media. T: On this project we collaborated with The Trust Project, which is an organization out of Santa Clara University, and they’ve been trying to get news organizations to place indicators of trust on their websites. They’ve gotten several hundred organizations as part of this initiative, where they’ve including things like author bios to indicate whether or not this a trustworthy source. In collaboration we developed an experiment where we gave people either a website that was a standard article that you might find on a website versus that exact same article with the addition of these “trust indicators.” Then we asked people after they saw these - what they thought about it. 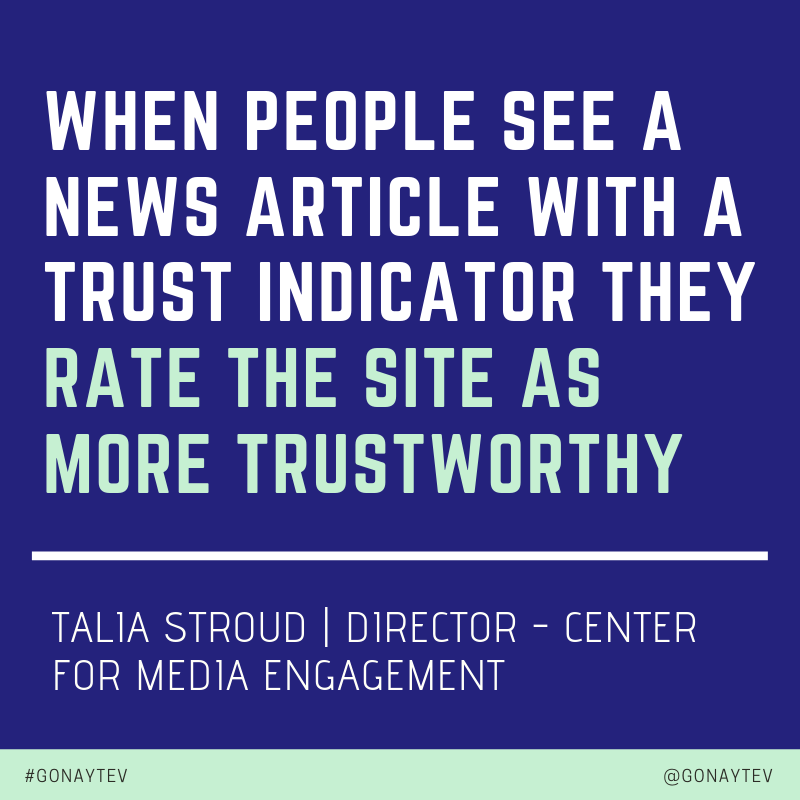 What we found was when people saw that article with the trust indicators they in fact did rate the site as more trustworthy and they saw the benefit of having the trust indicators on the website. So I think it was an important demonstration to what the Trust Project is trying to do in the media environment. T: Yeah, I definitely think it’s interesting. The other interesting component of the trust project is that they’re working with Facebook and Google to understand if these indicators can be used to feed their products. So it’ll be interesting to see how this one plays out. T: So we’ve done a couple of studies, looking at how websites could be redesigned. The overarching conclusions of these studies is that site design matters a lot. The way in which the site is structured influences the way people learn from your site and influences whether people click and how often they click. So that’s kind of the overarching conclusion of these. In this particular study, we partnered with two large news organizations as they were undergoing a redesign. And worked with them to try and evaluate with them how their redesign was working. What we found again was that the design of the site really matters. And when sites were using more “contemporary” design (we’re calling contemporary design, but it’ll probably change in three years). When sites were doing things that were more image based that included less hierarchy among all the articles - giving all articles images and equal real estate on the site. People were clicking more frequently and spending more time with that information. And I encourage all sites to really do that early work and test it [redesign.] Because we’ve definitely seen instances where sites have done a redesign and then see diminishing returns for their key metrics. And haven’t done as much testing as they could have before hand to make sure that the redesign would actually have the effect that they hoped it would. P: I think there’s lots of ongoing work that needed in this space where you have to balance your reader interest and your commercial interests. Jon Roberts, President of Dotdash Finance, has helped advance some really interesting updates to Dotdash's properties. One big thing he helped advocate and push for was reducing the volume of ads on site, which actually ended up increasing revenue and user stickiness. There’s lots of counter intuitive things that might fly in the face of traditional revenue approaches that will benefit your business and readers. T: Couldn’t agree more. Our research definitely supports that. P: The last study we’re going to talk about today is, “A Survey of Snapchat Users, Media Politics and the Election,” and this one is really interesting, in that, even though it was focused on the 2016 election, a lot of these findings are still really relevant on how people interact with content today, and something to keep in mind for the upcoming election cycle. T: I think that’s definitely true. I think the most surprising part of this finding was most of the people in response to this survey, we only talked to snapchat users, told us that Snapchat is not really the place for politics or news. It’s not really the right venue. However, pretty significant percentages of people on snapchat said that they had seen and engaged with political content they had seen on Snapchat. So it was this interesting mix of “this isn’t the right place,” but we’ve done it and we’ve gained something from engaging with politics. 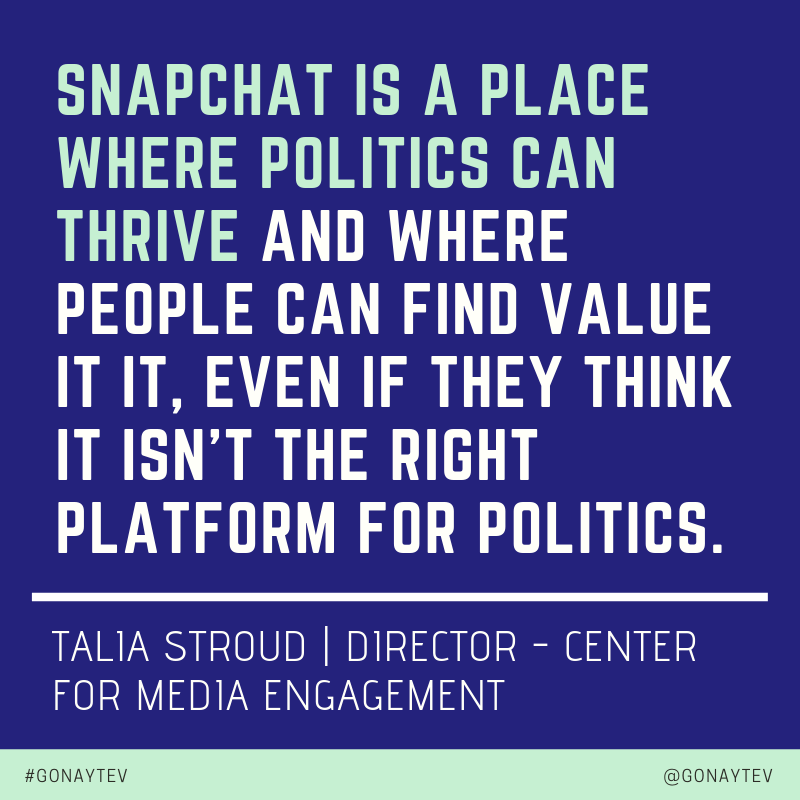 If I were to say what is a lesson looking forward - I would say that Snapchat is a place where politics can thrive and where people can find value in it even if they think it isn’t the right platform for politics. P: It reminds me of a study that I did in college. Facebook was brand new, and I interviewed 100+ people. I was asking them if Facebook became heavily commercialized would you still want to use Facebook? Overwhelming answer was “No, I would not be interested in Facebook.” However - Facebook had already been commercialized. They were already interacting with commercialized content in a very natural way. We’re going to change gears a little bit, and I’m going to ask you a couple of higher level questions about the studies you’ve done and what’s coming up in the future. First, what’s the most counter-intuitive thing that you learned in the past couple of years studying the media space? T: I think the study that I keep thinking as really important is actually the one that we worked on with you all, because the results showed that what I click on may not be the same thing that I like or that I comment on. I think that’s under appreciated and I think that could really change the way journalism works. Facebook prioritizes things on clicks, but they also prioritize thing based on likes and other forms of engagement like commenting. Engagement can also include clicks, but the engagement I’m talking about here is reactions and comments. To the extent that the algorithms favor these other, other ways of engaging with content it could have a big influence on the way that journalism is done. At least from the perspective of strategy versus issue content that we analyze, we know from academic research that strategy content (when you’re talking about who’s ahead and who’s behind in the horse race) tends to be connected to more political cynicism, people find it off putting in some ways and issue coverage doesn’t have those same problematic effects. And so, because, the engagement components of reactions and commenting actually favor issue coverage, it could change the way journalism is doing its work if those become more prioritized within feeds. So I think as we look forward that’s something to be attentive to and was something that surprised me. P: It really surprised me as well. We’ve obviously done a very large volume of content tests on social with many teams (brands and media companies), and it's certainly an ongoing learning experience, but this was something that certainly caught my attention. I do wonder to what extent newsrooms will take these sorts of findings and actually act on them as opposed to just discuss experimentation with them. T: Yeah, I think for this one it really depends on the incentive of the newsroom. If it’s a newsroom that really hunting for clicks, this [study] will confirm existing practices and lead them to continue on that path. If they’re starting to switch and think more about how can we get people get more engaged with our content in ways on social media like commenting on it, I think that will lead them to make changes. I also think that this has implications for the platforms when they’re figuring out their algorithms and what to surface more of. It makes a difference in terms of what is rewarded in journalism. I think the the biggest impact of a study like this is the emphasis for newsrooms to continue doing this sort of testing, because it’s so important to figure out what works for your particular audience. Certain frames/ways of discussing the news can have greater resonance than others and when you write an article there are so many different ways you can frame it. 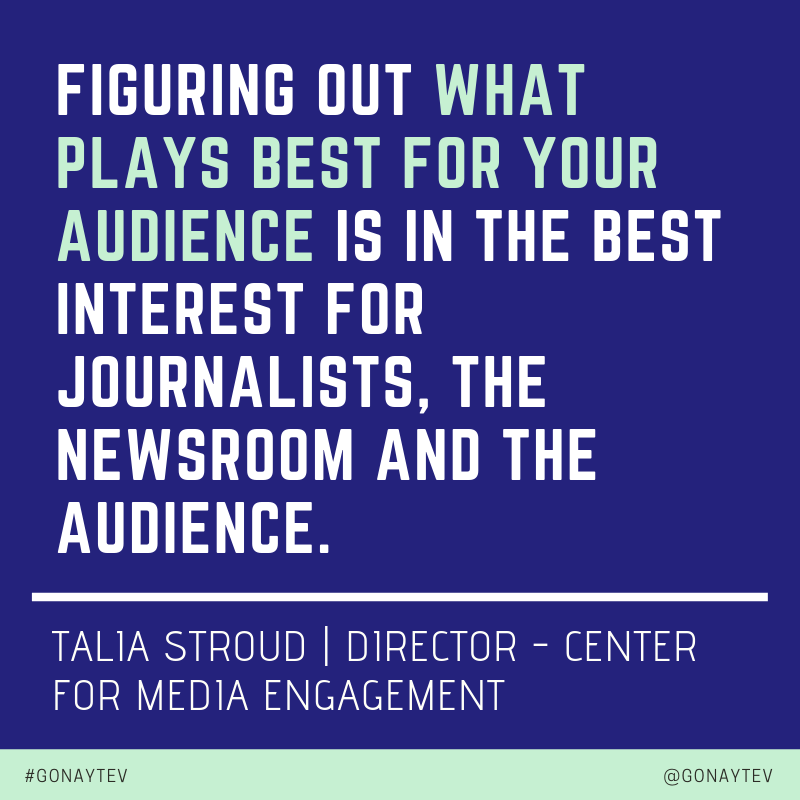 Figuring out what plays best for your audience I think is in the best interest for journalists, the newsroom and audience. P: Really fascinating. Well, beyond the counter-intuitive side, I was curious, of all the studies you’ve done in the past 2 years, what is the study you’d be most interested in refreshing in 2025? T: One of them would definitely be the Chicago Study, because I’m curious -- there’s so many new media efforts going on in Chicago right now. It’s sort of a hub of innovation. I want to know in 2025 did something change can we see that people are orienting differently toward the media, especially on the South and West Sides? I really want to redo that one to understand, can communities change particularly in a relatively short time period with a lot of energy being placed there? For the second one, I would be interesting in doing this Facebook study again [with Naytev] to understand whether in a different political climate or a different moment do we still see the same styles of content rising to the top. Do we still see this differentiation in what’s liked and what’s clicked on? Those would be the two I would nominate. P: What media trends are you most concerned about? T: Right now, the biggest thing that continues to be a major concern is the extent to which journalists are being laid off, the extent to which we see newsrooms closing, the extent to which we see news deserts cropping up - I’m just so fundamentally concerned about news as an industry right now and hope that we can help in anyway possible to give insights on what works and what doesn’t, so newsrooms don’t spend a lot of money and time on projects/initiatives that don’t connect them to their community, but in turn have a business implication for them. My biggest concern is the industry overall. P: Are you more concerned about local news in that picture? Or just the industry overall? T: I think that local news is really the place that we’ve seen people being laid off, we’ve seen closures, so I think that is the area where I am tremendously concerned. On a national level, and in some cases a local level, I am concerned about the extent to which partisanship is being injected into our news diet. I don’t think having partisan media is bad, I think they’re actually good things, but if people are only looking at partisan media or our media environment only offers partisan content, then I do think we have a problem and I’m concerned about that if we look beyond the local level. P: Are there any studies that you hoped to do in the past that weren’t viable due to some technological barrier? T: So many of our studies! It would have been really exciting to see news audience behavior across platforms. Technology wise, there are ways that people have tried to do that. Newsrooms have tried to make people register for instance, but people often go to sites without registering and they’re not logging in on every device. I feel like we’re missing a complete picture of people’s news and media diets because we don’t have the ability to understand who they are across platforms. There are certainly security reasons and privacy reasons that we would want to make sure that people are fully informed, but from a research perspective and from a newsroom perspective - understanding people’s complete diet and how they go from device to device...I think it would be interesting and it would spark innovation for people who are trying to make those transitions throughout their day. P: If you had people agree to have [browser] fingerprinting technology track their consumption, would that address your technological barrier in that case? T: It would definitely help and there would have to be so many little careful protections for their privacy. Because that is an issue. So I think we would want to think through how we would do that - to the extent that it is possible, I really think that is valuable data. P: To wrap things up, what topics are you most excited to investigate in the year ahead? T: One of the projects that we have in progress right now - that I’m going to be super excited to evaluate what we find is we worked with a news organization that is a corporate company that has lots of different news organizations under it. They worked with us to randomly assign some newsrooms to work with us to increase their engagement, but not others. We’ve been working with them now for 7-8 months and tracking what happens in those communities and newsrooms. I’ll be very excited to analyze and dig into those results and then share them sometime next year. We’re also doing some more work looking at how to bring people together across divides to understand what are the best mechanisms for doing this. We have a couple of different projects with newsrooms on that topic. So those are just two that are exciting to share this coming year. P: I can’t wait to see those come out! Talia, thanks so much for your time today and I encourage everyone visit the Center for Media Engagement’s website. T: Thank you so much Patrick it’s a pleasure! Natalie (Talia) Jomini Stroud (PhD, University of Pennsylvania) is an Associate Professor of Communication Studies and Journalism and the founding and current Director of the Center for Media Engagement in the Moody College of Communication at The University of Texas at Austin. The Center for Media Engagement examines commercially viable and democratically beneficial ways of improving media. 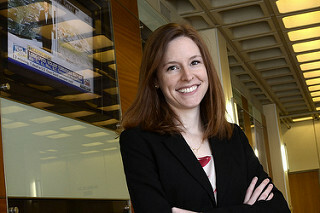 Stroud’s research has received numerous national and international awards, including the International Communication Association's prestigious Outstanding Book Award for her book Niche News: The Politics of News Choice. Stroud twice received the Outstanding Faculty Member Award from the Communication Studies Graduate Community.